If you are a Christian who is at least 15 years old, you will never be in better shape to serve the Kingdom than you are today. Every day that passes is one less day of youthful vigor and energy to spend for the Kingdom of Christ. As you watch the years quickly slip away, tasks will gradually become harder, things will take longer, children will limit your availability and mobility, your body will slowly break down, and the same amount of work for Christ will soon require double the effort. It’s a fact of life. The question is: What are you doing with your youth while you still have it within your grasp? You won’t be young forever. Having just turned 30 myself, I’m already over the hill. I quietly cry myself to sleep every night as my youth slowly drifts into the past. Each day I am forced to come to grips with the fact that I am less capable than the day before. If you asked a teenager what “being young” was all about, he might fill your ears with tales of antics, parties, late night video games, wildness, and irresponsibility. Honestly, many of these words describe my youth. However, if you are a young Christian, you cannot afford to waste your young life. Your Youth Is A Gift. “Rejoice, O young man, in your youth, and let your heart cheer you in the days of your youth. Walk in the ways of your heart and the sight of your eyes. But know that for all these things God will call you to give account. Remove vexation from your heart, and put away pain from your body, for youth and the dawn of life are a fleeting breath. Have you ever considered that your youth is a gift from God? He will ask you to give an account for you spent your young years. These verses do not encourage young believers to hamper the exuberance of youth or the energy of young life. Rather, these verses call us to channel these fleeting resources for the sake of God’s Kingdom. The sad truth is that many young Christians have only a few years where youthfulness and Christian responsibility overlap. As we mature, we begin to see that youthful energy is an asset to Christ’s Kingdom, only to realize that much of it’s already slipped through our fingers. How are you spending your days? How are you spending your nights? 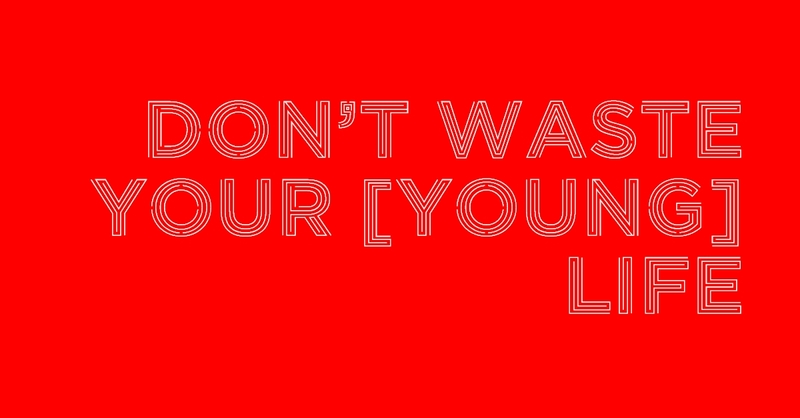 Are you wasting your young life? The passion and enthusiasm of your young years belong to God. He gave them to you to use for the building of his Kingdom. Are there elderly members of your church that are trying to perform tasks that YOU could and should be doing, if only you’d set aside the X Box controller for an hour? Are you disengaged from your church because you have filled your week with fun but meaningless activities? Is anything you have done in your teenage/college years going to have an eternal impact? Redeeming your time (Eph. 5:16) means getting the best bang for your buck. How are you spending these valuable years–years God has blessed you with limitless energy and drive? What kind of return will you offer to God for the youth he has invested in you? Next Post New Articles at CAPC and FTC! I wish I had spent more of my youth concerned with others and not so much myself. This is encouraging to me. I was always the goody goody, the holier than thou, in highschool. Not because I thought I was better than anyone else, but because I tried to live up to my Christian upbringing when not at home. I was never invited to parties because they knew not to ask. I take a stand for biblical principles and morals that most of your middle to elderly aged people stand for, and I think, “am I the only one my age?” I know this stems from Satan, but I’ve thought at times that I’m too old for my age so to speak, but I just can’t believe that. For instance, the way girls dress now days, even in church! I’ve thought, you need to catch up with the times, but I know what God’s word says on the matter and how women should behave toward men. We are to be discreet. This post was encouraging, because I must admit that many times I feel like I’m the only young person who believes just what you said, that our youth should be focused and centered around Christ and His work.